Both the original "John 3:16 Conference" and the upcoming "John 3:16 Conference" are conferences at which some prominent Southern Baptist preachers and teachers seek to refute the theological positions that are commonly called "Calvinism." What I would love to see-- and what, I would argue, would be much more beneficial to the body of Christ-- is an actual John 3:16 Conference: a conference that is focused on that beloved verse that has been so meaningful to Christians throughout the ages. 1. 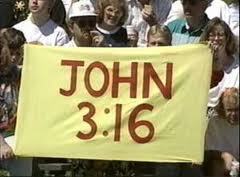 John 3:16 in Personal Evangelism. When I was a member at New Canaan Baptist Church in Dallas, GA, Sister Amy Cole presented a method of evangelism that utilized John 3:16 as the only verse that was directly cited. One particular benefit of this method of evangelism is that new Christians, who had not previously had much exposure to Scripture, could memorize a single verse and be reasonably well-equipped to share their faith with family and friends. Even if other verses are brought into the conversation (and, in most situations, they probably should be), John 3:16 can provide a kind of "backbone" to the gospel presentation, keeping the evangelist focused on necessary elements of the gospel that are explicitly found in this verse: God, His Son, and the world's necessary response of faith in God's Son. (The evangelist must also be careful to explain crucial gospel concepts that are implied, rather than explicitly found in John 3:16: sin, the Cross, and the Resurrection.) Hopefully, you can begin to see how an entire session at a conference could be devoted to this topic. 2. John 3:16 in Context. One session in a true John 3:16 Conference could be devoted to examining the whole of Jesus' encounter with Nicodemus (John 3:1-21). This session could explore how the truths contained in John 3:16 are related to other core truths of the Christian faith, such as: the necessity of spiritual re-birth (John 3:3), the sovereignty of the Holy Spirit (John 3:8), and the reality of the present and coming judgment (John 3:18-20). 3. John 3:16 and Biblical Theology. One session in a true John 3:16 Conference could take one or a few concepts found in John 3:16 and examine how these concepts are developed throughout different sections of Scripture. Concepts to be examined could include: God's sending activity, God's self-sacrificial love, and the necessity of faith. 4. John 3:16 and Historical Theology. One session in a true John 3:16 Conference could explore how different pastors/theologians have preached/taught from John 3:16 throughout the history of the Church. Similarities in how they understood the text could be demonstrated, and possible distinctives for how the text was applied in different times/situations could be examined. 5. John 3:16 and Systematic Theology. One session in a true John 3:16 Conference could explore how key doctrines from Systematic Theology help inform a right understanding of John 3:16. Take the Trinity, for example. Some skeptics have pointed to John 3:16 as an example of the notion that (according to them) the Bible teaches 'divine child abuse,' since God is giving away His only Son that the Son might be killed on the Cross, as is made clear from the climax of the Gospel of John. On the other hand, some Muslims may point to John 3:16, which requires belief in the Son for salvation, as an example of the notion that (according to them) we do not honor God as we ought, or that we worship more than one God. How are Christians to give a reasonable answer to such objections? The Doctrine of the Trinity is helpful here: God the Father and the Son are indeed distinct Persons, so that "[the Father] gave His only Son," but they are one in essence, so that God sacrificed Himself on the Cross, and so that in believing in the Son we believe in the one true God. Hopefully it is apparent that an entire worthwhile conference could be formed for the purpose of actually examining John 3:16. (Some of the above categories could easily be sub-divided.) Such a conference could be the beginning of a series of conferences, each focused upon one of the Bible verses in which the gospel is succinctly summarized. Future conference could be over Romans 5:8, Romans 6:23, 1 Corinthians 5:21, etc.